There is a 18-strong fleet of sailing superyachts already registered for the Loro Piana Superyacht Regatta 2016. It's not too late to add your yacht to the list - check our registration page for more information. You must be quick, as entries close on May 8. For the 2016 regatta, a fleet of 12 Wally yachts will race alongside the superyachts already registered for the Loro Piana Superyacht Regatta. Please click through the gallery to see details on each of the yachts, listed in alphabetical order. Ohana and Whisper have just joined the fleet and will be added to this list presently. Ammonite Ammonite is a 24.72 metre sailing yacht and will be one of the newest yachts on show at the regatta. She was delivered this year by Southern Wind Shipyard and designed by Nauta Design, with naval architecture by Farr Yacht Design. 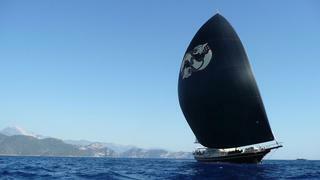 Ammonite's maiden voyage will see her sail from Cape Town to Sardinia ahead of the Loro Piana Regatta. 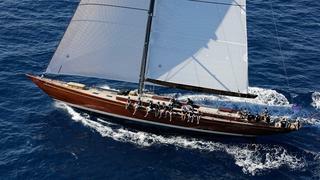 Following the regatta in Porto Cervo, she is planning on racing at the Maxi Yacht Rolex Cup in September. There is a 18-strong fleet of sailing superyachts already registered for the Loro Piana Superyacht Regatta 2016. It's not too late to add your yacht to the list - check our registration page for more information. You must be quick, as entries close on May 8. For the 2016 regatta, a fleet of 12 Wally yachts will race alongside the superyachts already registered for the Loro Piana Superyacht Regatta. Please click through the gallery to see details on each of the yachts, listed in alphabetical order. Ohana and Whisper have just joined the fleet and will be added to this list presently. 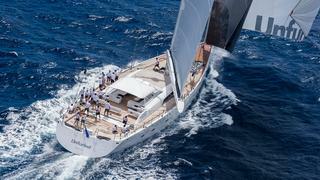 Ammonite is a 24.72 metre sailing yacht and will be one of the newest yachts on show at the regatta. She was delivered this year by Southern Wind Shipyard and designed by Nauta Design, with naval architecture by Farr Yacht Design. Ammonite's maiden voyage will see her sail from Cape Town to Sardinia ahead of the Loro Piana Regatta. Following the regatta in Porto Cervo, she is planning on racing at the Maxi Yacht Rolex Cup in September. Daima was built in Anatalya, the home of Turkish builders Arkin Pruva, in 2009. Ibrahim Karatas designed the 42.5 metre sailing yacht while the interior design featuring crocodile skin wall covers and seashell-covered ceilings is by Aylin Örs. Crewed by a New Zealand skipper and six Turkish crew members, Daima previously won the Bodrum Cup, an international wooden yacht race in Turkey on three separate occasions and is one to look out for at the Loro Piana Superyacht Regatta. Daima was built in Anatalya, the home of Turkish builders Arkin Pruva, in 2009. Ibrahim Karatas designed the 42.5 metre sailing yacht while the interior design featuring crocodile skin wall covers and seashell-covered ceilings is by Aylin Örs. Crewed by a New Zealand skipper and six Turkish crew members, Daima previously won the Bodrum Cup, an international wooden yacht race in Turkey on three separate occasions and is one to look out for at the Loro Piana Superyacht Regatta. Gaia is a 30.6 metre yacht built in 2007 by Spirit with a top speed of 10 knots. Built in a lightweight wood epoxy and weighing less than 50 tons, Gaia is one of the fastest 100' cruisers ever built. She also carries a brand new set of 3DL sails. Gaia was unable to hold on to third place in last year’s event when she headed into the last day of racing joint third with Blues. Gaia is a 30.6 metre yacht built in 2007 by Spirit with a top speed of 10 knots. Built in a lightweight wood epoxy and weighing less than 50 tons, Gaia is one of the fastest 100' cruisers ever built. She also carries a brand new set of 3DL sails. Gaia was unable to hold on to third place in last year’s event when she headed into the last day of racing joint third with Blues. Grande Orazio is a 24.72 metre yacht built by Southern Wind Shipyard in 2014. The naval architect was Farr Yacht Design and she is designed by Nauta Yachts. Grande Orazio will return to the Loro Piano Superyacht Regatta as defending champion and the yacht to beat in Class C after winning the 2015 regatta as well as the 2014 race. A near-winner in 2015 - could she claim victory this year? Built by Vitters in 2014 and designed by Dubois Naval Architects, Ganesha is a 46 metre sailing yacht. The interior, designed by Katharina Raczek of Newcruise, accommodates guests in four cabins in a full-beam master suite and three doubles. Special features include a fixed carbon bimini with vertical sliding windows. 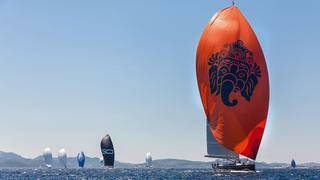 Ganesha just missed out on victory at last year’s Loro Piana Regatta in Class A, losing to Saudade on a count back. Built by Vitters in 2014 and designed by Dubois Naval Architects, Ganesha is a 46 metre sailing yacht. The interior, designed by Katharina Raczek of Newcruise, accommodates guests in four cabins in a full-beam master suite and three doubles. Special features include a fixed carbon bimini with vertical sliding windows. 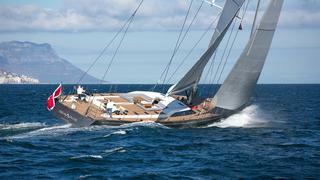 Ganesha just missed out on victory at last year’s Loro Piana Regatta in Class A, losing to Saudade on a count back. Unmissable with its vibrant green hull, Inoui is a 33.4 metre yacht which was built in 2013 by Vitters and designed by Philippe Briand. 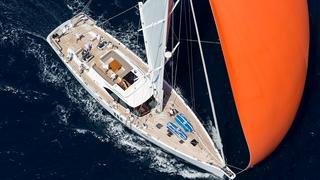 Inoui came a close second in the Loro Piana Caribbean Superyacht Regatta and Rendezvous in March this year. She was involved in a dramatic head-to-head battle with Nilaya, with a win each to their name heading into the final day of racing. But despite her spinnaker blowing out at the first downwind leg, Nilaya held on to win ahead of Inoui and claimed victory in the Class A event. Inoui also won the judges' special award for design and high-quality construction at the 2014 World Superyacht Awards. Unmissable with its vibrant green hull, Inoui is a 33.4 metre yacht which was built in 2013 by Vitters and designed by Philippe Briand. 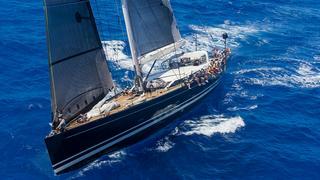 Inoui came a close second in the Loro Piana Caribbean Superyacht Regatta and Rendezvous in March this year. She was involved in a dramatic head-to-head battle with Nilaya, with a win each to their name heading into the final day of racing. But despite her spinnaker blowing out at the first downwind leg, Nilaya held on to win ahead of Inoui and claimed victory in the Class A event. 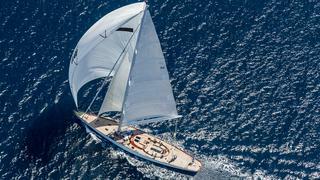 Inoui also won the judges' special award for design and high-quality construction at the 2014 World Superyacht Awards. Launched in April 2016 Firebird is one of the 885 series by Oyster and is designed by Rob Humphreys Yacht Design. Firebird was last spotted cruising through the Mediterranean ahead of her delivery, but it's the Loro Piana Superyacht Regatta that will be her racing debut. The hull of the Oyster 885 series is balanced and powerful, with a fairly fine entry that will help the boat cleave through a seaway. The stern is relatively broad to deliver a high level of form stability and an off-wind potential that will rattle away the miles in any trade wind passage. The Oyster 885 has a twin rudder configuration and for slick manoeuvring in harbour, she will be fitted with both stern and bow thrusters. Launched in April 2016 Firebird is one of the 885 series by Oyster and is designed by Rob Humphreys Yacht Design. Firebird was last spotted cruising through the Mediterranean ahead of her delivery, but it's the Loro Piana Superyacht Regatta that will be her racing debut. The hull of the Oyster 885 series is balanced and powerful, with a fairly fine entry that will help the boat cleave through a seaway. The stern is relatively broad to deliver a high level of form stability and an off-wind potential that will rattle away the miles in any trade wind passage. The Oyster 885 has a twin rudder configuration and for slick manoeuvring in harbour, she will be fitted with both stern and bow thrusters. Maegan is a 25.15 metre yacht built in 2014 by Oyster and designed by Rob Humphreys Yacht Design. She made her regatta debut in Class C at last year’s regatta. After a flying start in the first day of racing she was leading the pack but struggled in dying wind and dropped down to fourth. At the 2016 Loro Piana Caribbean Superyacht Regatta and Rendezvous she finished all three races second, behind overall winner Freya. Maegan is a 25.15 metre yacht built in 2014 by Oyster and designed by Rob Humphreys Yacht Design. She made her regatta debut in Class C at last year’s regatta. After a flying start in the first day of racing she was leading the pack but struggled in dying wind and dropped down to fourth. At the 2016 Loro Piana Caribbean Superyacht Regatta and Rendezvous she finished all three races second, behind overall winner Freya. My Song was built in 1999 by Cookson and designed by naval architect Reichel-Pugh. At 25.6 metres in length it has a cruising speed of 10 knots. Returning as defending champion in Class B, My Song recorded an impressive three wins from three races at last year’s event to claim an undisputed victory. She endured a tight tussle to keep WinWin at bay but came out on top. Calling the shots that day was America’s Cup veteran Tommasso Chieffi. My Song was built in 1999 by Cookson and designed by naval architect Reichel-Pugh. At 25.6 metres in length it has a cruising speed of 10 knots. Returning as defending champion in Class B, My Song recorded an impressive three wins from three races at last year’s event to claim an undisputed victory. She endured a tight tussle to keep WinWin at bay but came out on top. Calling the shots that day was America’s Cup veteran Tommasso Chieffi. The 38.15 metre P2 was built by Perini Navi with exterior design by Philippe Briand. She became a champion again at the 2016 Loro Piana Caribbean Regatta and Rendezvous, where she was also the defending champion. At the same event in 2015 P2 also claimed The Loro Piana Prize: The Boat International Media Trophy for the lowest scoring yacht of the week. 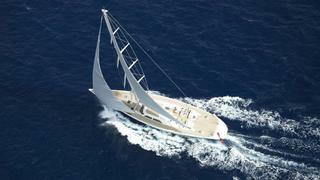 The 38.15 metre P2 was built by Perini Navi with exterior design by Philippe Briand. She became a champion again at the 2016 Loro Piana Caribbean Regatta and Rendezvous, where she was also the defending champion. At the same event in 2015 P2 also claimed The Loro Piana Prize: The Boat International Media Trophy for the lowest scoring yacht of the week. The 45.19 metre yacht Saudade was built by Monaco-based Wally Yachts and designed by Eidsgaard Design with naval architecture by Bill Tripp. 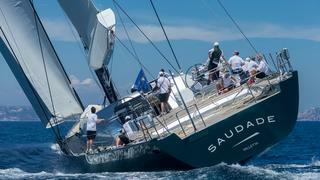 Suadade will return as defending champion in Class A after winning her first regatta at last year’s close encounter. The victory was handed to Suadade on a countback after failing winds resulted in racing being abandoned. The 45.19 metre yacht Saudade was built by Monaco-based Wally Yachts and designed by Eidsgaard Design with naval architecture by Bill Tripp. Suadade will return as defending champion in Class A after winning her first regatta at last year’s close encounter. The victory was handed to Suadade on a countback after failing winds resulted in racing being abandoned. The 31.78 metre Seawave was launched by Southern Wind Shipyard in July 2015. The naval architecture is by Farr Yacht Design while the exterior and interior design is by Nauta Design. Seawave is the fourth hull in the successful Southern Wind 102 semi-custom series. She is the second hull in the series to have the raised saloon configuration, which offers an open saloon with light pouring in down below. The 31.78 metre Seawave was launched by Southern Wind Shipyard in July 2015. The naval architecture is by Farr Yacht Design while the exterior and interior design is by Nauta Design. Seawave is the fourth hull in the successful Southern Wind 102 semi-custom series. She is the second hull in the series to have the raised saloon configuration, which offers an open saloon with light pouring in down below. Built by Royal Huisman in 2000 the 34.17 metre yacht was sold under the name Unfurled in 2015. The naval architecture is by renowned designer German Frers with the interior design by Winch. 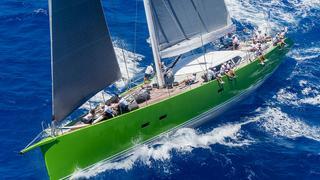 She was built as a ‘racing certainty’ with Frers’ performance hull and Winch’s minimalistic design. Spiip is equipped with a carbon rig and in boom furling system from Martin Marine, and has a clean, simple deck arrangement with a self-tacking jib. 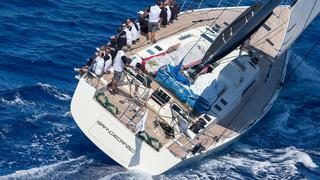 Racing under Unfurled, she won the 2013 St Barth Bucket Gazelles. Built by Royal Huisman in 2000 the 34.17 metre yacht was sold under the name Unfurled in 2015. The naval architecture is by renowned designer German Frers with the interior design by Winch. 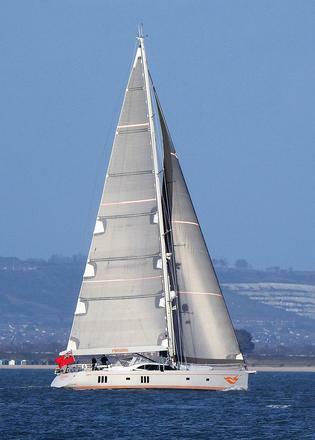 She was built as a ‘racing certainty’ with Frers’ performance hull and Winch’s minimalistic design. Spiip is equipped with a carbon rig and in boom furling system from Martin Marine, and has a clean, simple deck arrangement with a self-tacking jib. 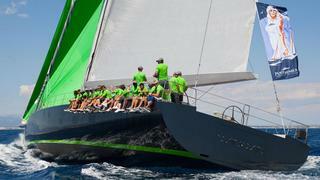 Racing under Unfurled, she won the 2013 St Barth Bucket Gazelles. Built by Arkin Pruva in 2013, 27.43 metre Tempus Fugit is currently for sale. Since launch, Tempus Fugit has participated and distinguished herself in some of the world's most renowned regattas, including Voile de St Tropez, NYYC Annual Regatta and Opera House Cup, as well as the Boat International Media-organised Loro Piana Superyacht Regatta and Loro Piana Superyacht Regatta and Rendezvous. She has reached speeds of over 15 knots under sail. With a blend of speed and style thanks to her highly varnished wooden hull she is ranked as one of the best modern classic yachts. Built by Arkin Pruva in 2013, 27.43 metre Tempus Fugit is currently for sale. Since launch, Tempus Fugit has participated and distinguished herself in some of the world's most renowned regattas, including Voile de St Tropez, NYYC Annual Regatta and Opera House Cup, as well as the Boat International Media-organised Loro Piana Superyacht Regatta and Loro Piana Superyacht Regatta and Rendezvous. She has reached speeds of over 15 knots under sail. With a blend of speed and style thanks to her highly varnished wooden hull she is ranked as one of the best modern classic yachts. The 46 metre sailing yacht _Unfurled _was built by Dutchyard shipyard Vitters in 2015, and launched at the start of this year. It was the first collaboration between Vitters and renowned Argentinian racing yacht designer German Frers. Although Unfurled is primarily designed as a cruiser, a great deal of attention has been dedicated to performance and sailing abilities which was proved with victory in Class A at the 2016 St Barths Bucket in March. Before that, in the Loro Piana Caribbean Regatta and Rendezvous she came third in Class B behind P2 in first place. The 46 metre sailing yacht _Unfurled _was built by Dutchyard shipyard Vitters in 2015, and launched at the start of this year. It was the first collaboration between Vitters and renowned Argentinian racing yacht designer German Frers. Although Unfurled is primarily designed as a cruiser, a great deal of attention has been dedicated to performance and sailing abilities which was proved with victory in Class A at the 2016 St Barths Bucket in March. Before that, in the Loro Piana Caribbean Regatta and Rendezvous she came third in Class B behind P2 in first place. With a close second place last year, can she take the podium this time? Built by Baltic Yachts and designed by naval architect Javier Jaudenes, WinWin, is a 33 metre yacht that was launched in May 2014. WinWin came second at last year's event in a close encounter with My Story. The racing was as close as ever last year and the 40-metre exclusion zone between each yacht was crucial. Each yacht heavily relied upon the use of the laser rangefinder which proved instrumental in keeping the racing fun but safe. At the time, WinWin captain Clive Walker said: “These boats are worth a lot of money and if two boats collide it could be a few thousand or a few million, and people could get hurt. The rangefinders are a very useful tool.” WinWin was named sailing yacht of the year at the World Superyacht Awards 2015. Built by Baltic Yachts and designed by naval architect Javier Jaudenes, WinWin, is a 33 metre yacht that was launched in May 2014. WinWin came second at last year's event in a close encounter with My Story. The racing was as close as ever last year and the 40-metre exclusion zone between each yacht was crucial. Each yacht heavily relied upon the use of the laser rangefinder which proved instrumental in keeping the racing fun but safe. WinWin was named sailing yacht of the year at the World Superyacht Awards 2015.